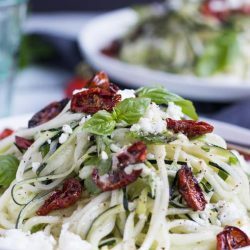 This easy zoodles recipe, tossed with lemon juice, oven dried tomatoes and creamy feta can be on the table in just 15 minutes. Just add a crusty loaf of bread to the salad for an easy vegetarian meal on a hot summer’s evening. Blitz all of the ingredients for the dressing together in a blender or food processor. I use a hand held blender for this task. Process until the dressing is smooth and creamy. Spiralise the zucchini using your preferred gadget. Place the raw zucchini noodles into a large bowl. Roughly chop or tear the basil leaves. Set aside. Pour the dressing over the noodles and toss the noodles gently through the dressing to ensure the zoodles are well covered with the dressing. Add the torn basil, tomatoes and crumbled feta to the bowl. Toss everything gently to distribute the basil, tomatoes and feta through the zoodles. ^ I like a very tart, lemony dressing on this salad, so I use 2 Tablespoons of lemon juice. If you prefer less lemon, use the lower amount of juice specified. * Semi-sundried tomatoes, sundried tomatoes or fresh cherry tomatoes can all be used in place of the oven dried cherry tomatoes. The zucchini can be spiralised up to 24 hours ahead. Once spiralised, keep the zucchini noodles in an airtight container in the fridge until required. The dressing can also be made up to 24 hours ahead; keep it in a jar in the fridge. This salad softens quite quickly once dressed, as the salt in the feta draws some of the moisture out of the zucchini. If you wish to make this ahead, prepare the zucchini and dressing separately, then dress the salad just prior to serving. Add a loaf of crusty bread for a simple vegetarian meal for 4.